Price includes download MP3 version. Difference between MP3 and WAV formats is explained in our shop FAQ. A branch snaps with icy confidence. It seems like an everyday occurrence, an everyday sound. But within the oeuvre of Michel van der Aa (1970), the snap of a branch means more than just that. In a musical context removed from the ‘everyday’, the gesture suddenly suggests loneliness, insanity, anger. And while the crisp noise a breaking branch makes is indeed pure nature, with closed eyes it also carries an electric charge. The gesture and the sound carry more layers and more weight than one might think. That breaking branch is a symbol for Michel van der Aa’s oeuvre in general and the Here trilogy in particular. One and – in a more abstract, purely musical way – the Here trilogy both owe their confrontational dramatic effect to the theme of loneliness verging on insanity. The drama is not an imposed extramusical idea, but rather a product of the musical structure. 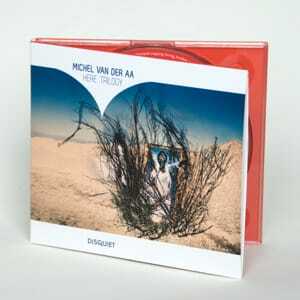 It is not surprising that Michel van de Aa’s oeuvre is often referred to as the musical equivalent of the work of M.C. Escher. Escher’s perspectivist suggestions and spatial manipulation find a musical parallel in Van der Aa’s equally intriguing play of acoustic distortion. In the Here trilogy as well, the dramatic content is an organic consequence of the poetics in Van der Aa’s music. Tension is aroused by the audible failure of the music itself, in which the musical present (live chamber orchestra or ensemble) clashes with the past (soundtrack). As a whole, that failure of the musical progress leads to the sensation of chilling, detachment and disunity that, after the purely instrumental first movement Here [enclosed], is given a voice in Here [in circles] and Here [to be found]. The December 2011 edition of the Swiss ‘Dissonance‘ magazine reviews our first three releases. You can read the text here (German). Information about our shopping service, product delivery, digital downloads, and customer support can be found in the store Frequently Asked Questions.